We offer advanced design- and computer aided construction services to the leisureboat and marine industry. Our high level of expertise in creating functional products for ease of manufacture makes it possible for us to follow up the idea to finished product. We will take on interior and exterior projects, and give our full attention if we work on a whole project as well as a sub-project. 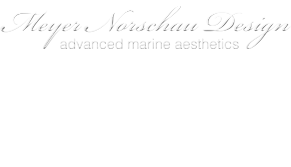 Meyer Norschau Design (MND) requires the builder to provide a list of standard components for the project. Further a list of suppliers for all special components should be presented upon completion of concept development stage 1. All this is to ensure design solutions are optimized for production and installation. i. Alternative is for MND to do photorealistic concept renderings for marketing purposes prior to detail design is commenced. e. Optimization for production, design review and adjustments. f. Redesign and redrawing, updating of previous MND projects are easily carried out at a later stage. 7. Advanced simulations: with our partner CFD Marine AS MND can offer the CFD analysis of hull designs or complete boat with superstructure. MND can produce photo-realistic renderings of projects to use in marketing material and high-end product presentations. ©2013 Meyer Norschau Design. All rights reserved.